Every day, millions of American use mass transit to get them where they need to be. In the past, one might have grabbed their evening newspaper on their way home from work or listened to a Walkman to drown out the sounds of other passengers. These days, mass transit users are turning to their cell phone as a source of entertainment or a way to continue working while journeying from one place to another. And they are doing so to an extent that makes them stand out above the general adult population as users of just about every function a cell phone can offer. In this USA TouchPoints analysis, we are defining mass transit users as people who used the bus, subway, or train during the week. 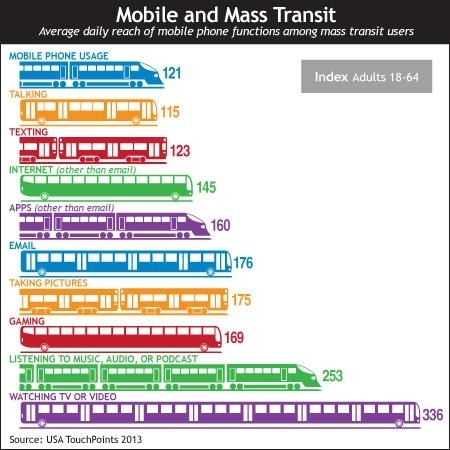 Talking, texting and using the Internet on a mobile phone, while used more often by mass transit users, still has a lower index than some of the other features. This could be due to poor cell signals in subways or not having access to service during their ride. Equally, it may also be a factor of the large number of people that use their phones for these purposes (talk and text remain the prevalent uses of mobile phones), thereby making a particularly high index inherently less likely. It is still notable that the index for these functions is as high as it is. Many of the other mobile phone functions can be enjoyed without access to a cellular signal. They either leverage the minimal signal strength and functions on the phone that require no link to the network. Similarly, email and other work-related activity is well-suited to time in transit, enabling users to feel both productive and connected to others. Many of the things that used to be solely accessed via a personal gaming device or iPod can now also be downloaded onto a mobile device. Mass transit users have the free time during their commute to maximize their use of entertainment vehicles. These users are more likely to listen to music, audio or podcasts they can download from iTunes, or use apps like Spotify and listen to music without the need for an additional device. Mass transit users are also significantly more likely to use their down time to catch up on TV or Video on their mobile device. This perhaps is one of the few upsides of a longer journey time.